My daughter told that she had received some advice about getting more people to read your food blog. More pictures! And recipes! Hmmm, I almost never put in recipes because I don’t make things that are recipe driven usually. But I guess I could do more pictures. So before I get to the finished product picture, here is a picture of ingredients. Much more than actually cooking, I like to cut things up. I would be the perfect sous chef. 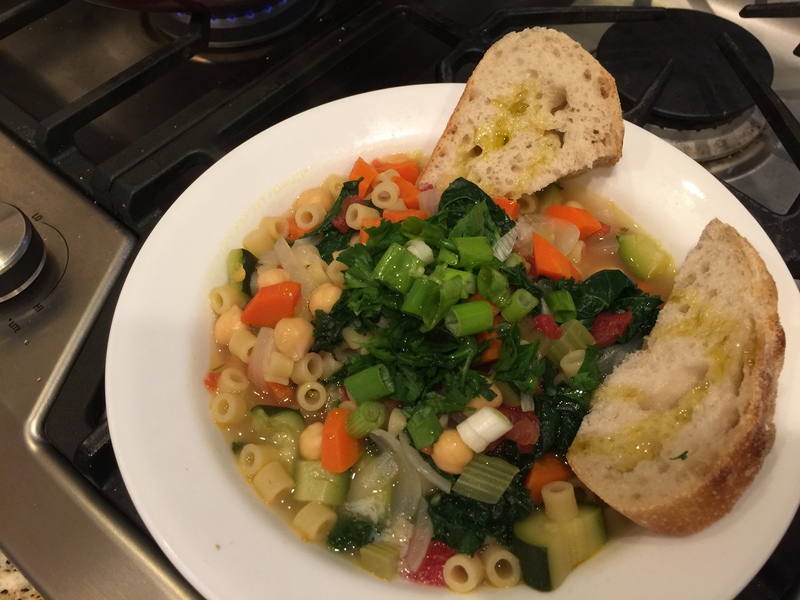 This chickpea stew has plenty of chopping and is inspired by the NYTimes Cooking’s “Chickpea Stew with Orzo and Mustard Greens.” Except that I use ditalini, kale, add zucchini, and substitute Rotel for the fresh tomatoes. 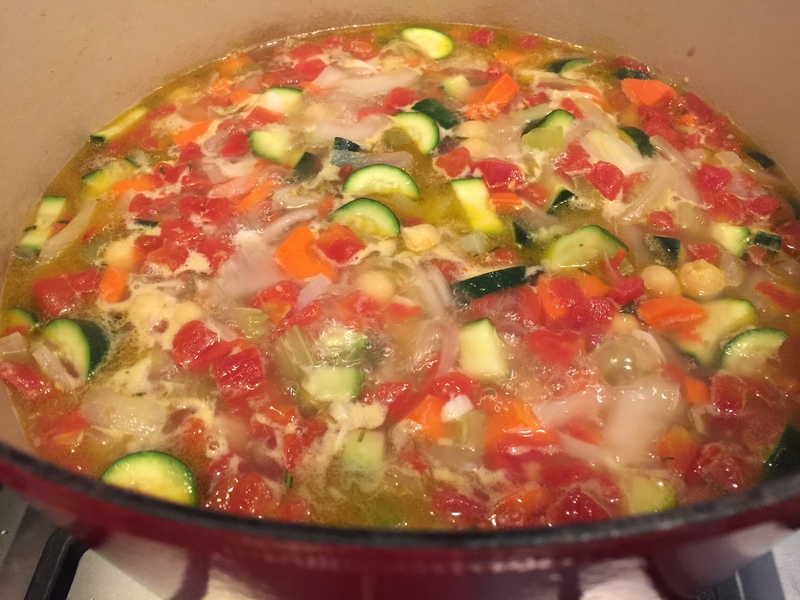 The recipe calls for chicken stock, vegetable stock, or water and finishing it with Parmesan cheese. What you do depends on whether this is vegan or vegetarian or neither. Oh, and here’s a picture of the pot burbling on the stove. (I forgot a took this one.) Don’t add the kale until the very end. The recipe makes a lot. I have enough left over for another meal. The ingredients are inexpensive and the whole thing comes together in about half and hour. Mmmm, cheap, fast, healthy, and really tasty! 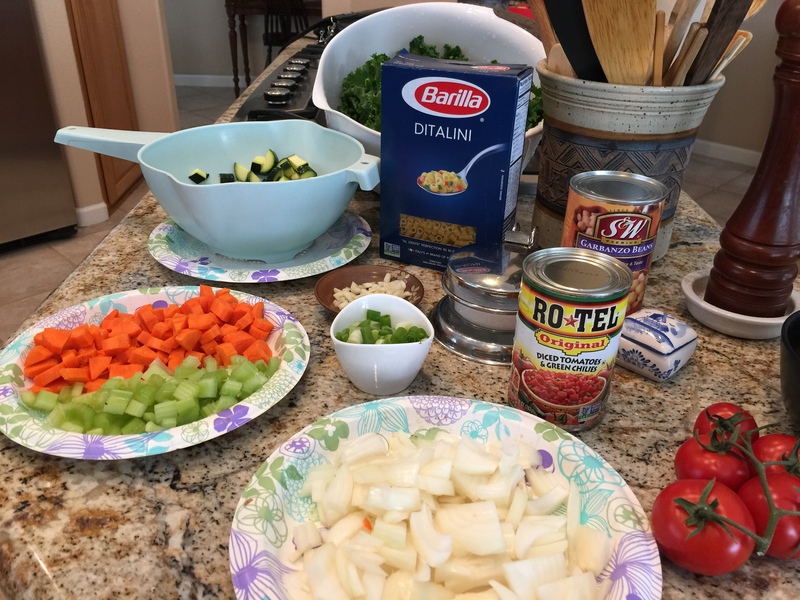 This entry was posted in Pasta, Vegan, Vegetables, Vegetarian and tagged carrots, chicken breast, chickpeas, ditalini, garlic, kale, Onions, pasta, stew, tomatoes, Vegan, Vegetables, vegetarian, zucchini. Bookmark the permalink.